Luke Skywalker, Owen Lars, and Beru Lars were moisture farmers because water on the planet Tatooine was so scarce. But one shot in the latest episode of Star Wars Rebels seems to mess with previous conceptions of the ecosystems on the famous desert planet: Now there’s at least one fairly large body of water on Tatooine. Mild spoilers for Star Wars Rebels, “Twin Suns” ahead. As Ezra Bridger flies his stolen A-wing fighter over the surface of Tatooine, one quick shot throws into question just how much water exists on Tatooine. Because, very clearly, Ezra briefly files over what is some kind of sizable body of water. Has it been previously established that there were large bodies of water on Tatooine? Well, no, it hasn’t, at least not in real Star Wars canon. But, on the other hand, it hasn’t necessarily been established there weren’t bodies of water on Tatooine either. The shot in question: Ezra flies over the surface of a watery Tatooine. According to Wookieepedia, the 2015 book Star Wars: Absolutely Everything You Need to Know claims that Tatooine’s total surface water accounts for 1% of the planet’s total makeup. So, what Ezra flies over could be that 1% of water, all in one place. Tatooine is a big planet after all, and so far, we’ve only a small amount of it; mostly the cities of Mos Espa and Mos Eisley. 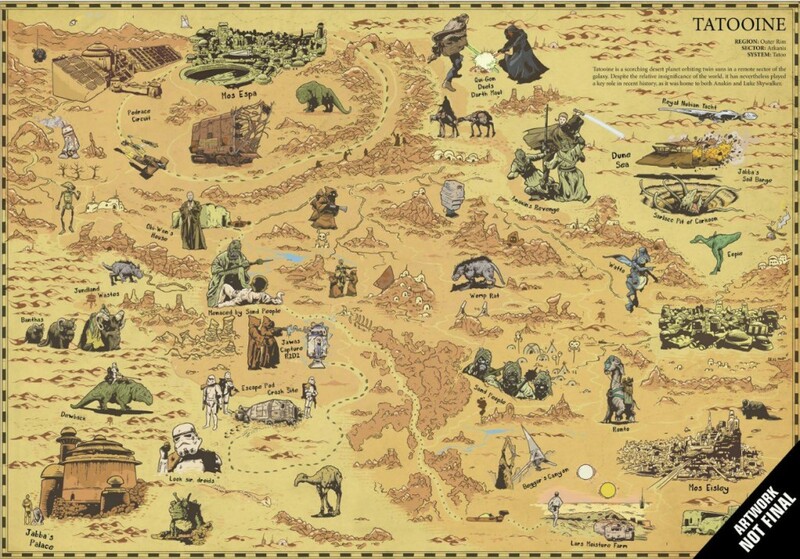 In fact, according to a map published in Star Wars: The Essential Maps and Cartography, pretty much all the population centers glimpsed in the existing Star Wars canon, from Jabba’ Palace to Obi-Wan’s hut, are all pretty much within driving (or speeder) distance. So, since we’ve only seen such a small part of Tatooine, a distant side of the planet, complete with a small body of water isn’t out of the question. It’s just been glimpsed here for the first time. Some older speculative Star Wars lore suggests that the Dune Sea was once a real ocean, and that over time Tatooine became increasingly arid. On our own planet, bodies of water obviously have “changed” locations over several millennia, meaning the version of Tatooine we see in existing Star Wars canon could represent a planet toward the end of its lifespan. The body of water Ezra flew over could be a leftover from an earlier incarnation of Tatooine, a planet where families didn’t need droids to fix their moisture vaporators in order to survive. Nevertheless, the sea, ocean, or lake seen in “Twin Suns” does permanently alter our perception of Tatooine, making it a smidgen more ecologically diverse than previously believed.